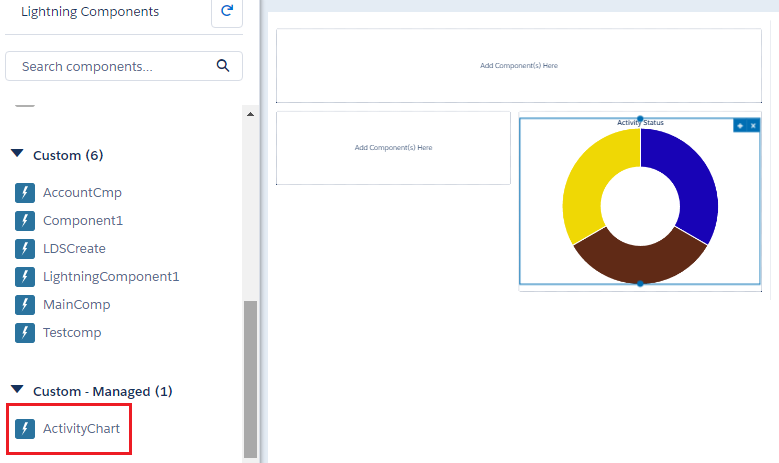 This post will walk you through an example on how to install and use a Lightning component from Appexchange . I would use my very own Lightning component “Lightning Activity Chart” which was published in Appexchange. You will see that there are a plethora of Lightning components available on Appexchange. These components come as plug-and-play components which you can simply install and start using right away. Now, before we go ahead with the steps to install and use this component let’s get some background on what this component does. 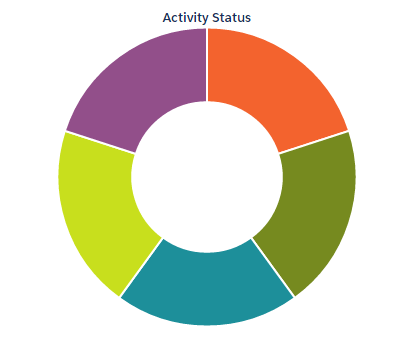 This component is basically a doughnut chart that will show you the count of all the tasks that are assigned to you, grouped by their statuses. It will give you a quick glance at the activities/tasks that are assigned to you over a fortnight. One of the important features of this component is that it only looks at the tasks that are one week behind and one week ahead of the current date. It has been designed this way because, the users wouldn’t be really interested in the tasks that are more than 1 week behind them or more than 1 week ahead of them. Since, the data is displayed in a graphical form, it will help the users to make quick decisions such as acting upon a set of tasks which is getting piled up. The component can be easily added to the Lightning home page, which will make it easier for the users to look at this data as soon as they login to their system. To use the component in your home page, you will have to create a custom home page and assign it to your profile. Simply follow the below steps to do this. Now, you should see the “ActivityChart” which was just installed in the Custom – Managed section as seen in the screenshot below. Just drag and drop this component into the editor as seen below. Not that you may see that the chart is blank in your case, because you don’t have any tasks assigned to you in the past week or the week ahead. The chart will be displayed only if you have a task assigned against you in the 2 weeks time frame. You can drag and drop other components into the other empty boxes or Leave it empty. Click Save > Activate > Assign this Home page to specific profiles. Then select the appropriate profile to whom this Home page should be displayed. As of now to test this you can just select the System Administrator profile. Click Next > Activate. You are done. 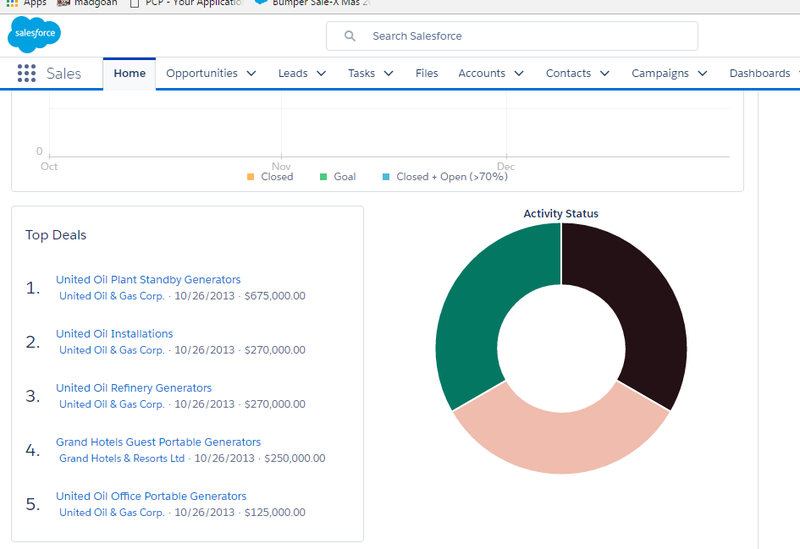 Now, just switch to the Lightning Experience in your org and see how the Home Page looks. It should look like as it is shown in the screenshot below. Previous Previous post: Master the art of building Lightning Components : Everything you need to know about Lightning Components ! 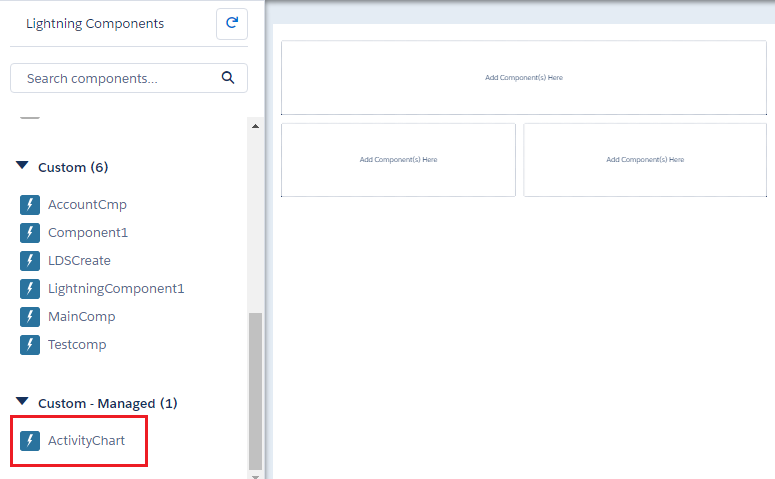 Next Next post: Do you want to Build a custom Lightning Component and Publish it on Appexchange ? See how I did it ! I can’t see this app to add it to community home page after installing in my org. Can someone help with this? I am unable to get this component in the lightning component list while trying to add this on the community home page. Any idea why is it so?